The Europa Grade 3, offers a very high level of cash security protection and is suitable for Supermarkets, Superstores any large commercial application. 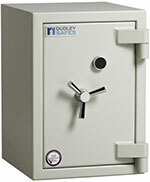 Dudley Europa Grade 3 safe has been designed to meet the stringent requirements of the European grading test safe standards. Construction embodies high grade approved barrier materials providing resistance in excess of criteria. Bolt work arrangement is 3-way moving with fixed rear dog bolts, 32mm bolts dia. Locking as supplied is by a single 11 lever double bitted key lock and dual interconnected passive relockers.